Help With Pre-Installation Planning Needed. Having had many upgrade problems in the past, I am hoping someone may be able to answer one or both of my pre-installation questions regarding NXT Pro 5. 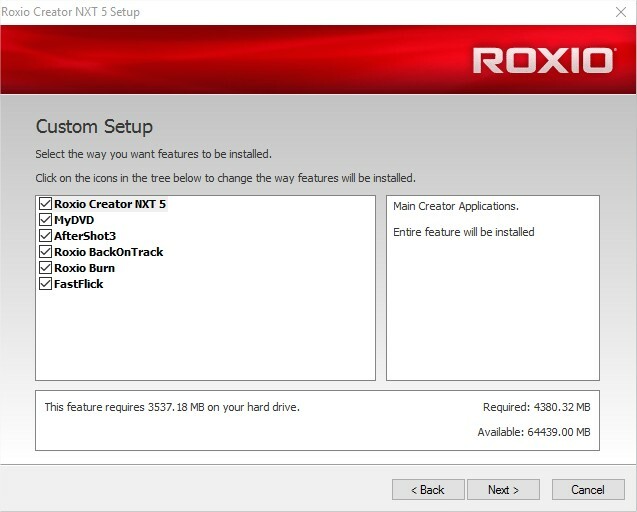 I do not want to install Back on Track and I was wondering if the Roxio Creator NXT5 install shield allows the user to select secondary applications to install or is it all or none? If applicable, can I run the following from an elevated command prompt to exclude installing Back on Track? Based on previous upgrades, the Roxio “Programs and Features - Add/Remove Programs” method leaves behind several hundred registry entries and many files and folders. Should I use the “CleanSystem.bat” uninstall method after uninstalling via Windows (i.e., per the link below)? Any help/input will be appreciated. Do a custom install, and uncheck BackOnTrack. That "cleansystem" method runs the Roxio setup.exe program with a parameter so it acts as an uninstaller. It is used instead of the Windows installer, not after the Windows installer. The "cleansystem" method was given to us for Creators 2011 and 2012, and NXT (original). I haven't run it in any other versions of NXT so I would be very interested to hear how you get on with it, if you don't mind. Thank you for the screen capture and the explanation of the "cleansystem" method, this information was very helpful. I am actually uninstalling a copy of 2012 pro; which I inevitably stuck with after running into many technical problems with NXT Pro 2 back in 2014. A nightmare upgrade at the time; I am hoping NXT 5 goes better. There are many of us here on the bulletin board who still that Creator 2012 is still better than any of the NXT versions which have followed it. It certainly seems to have more features and abilities than them, and it has a good MyDVD - which NXT 5 no longer has. On my Win 10 PC I have NXT 5 installed but put Creator 2012 on after that and the two seem to live in harmony.